Your skis are mostly made of carbon these days, so it only makes sense to wrap your dome in carbon, too. 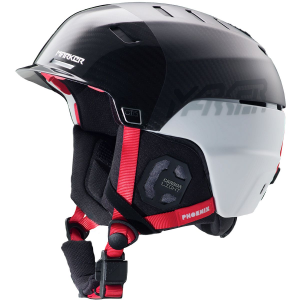 Marker would like to introduce the Phoenix Otis Carbon Edition Helmet, an innovative step in ski safety for backcountry touring, splitboarding, and snowboarding. Not only is the entire shell made of carbon to keep the helmet lightweight and protective, but the Phoenix also features Marker's new Map Protection Pads for extra protection in key areas. Research studies show that most head injuries occur at the rear of the head, forehead, and temples while skiing and snowboarding, so Marker reinforced the Phoenix in those specific areas with extra padding to further reduce head injury. The Phoenix also features Marker's Climatic ventilation system for opening and closing vents, a rotating RTS Fit System for a secure fit, an XDry Performance lining that wicks moisture, and removable ear pads for audio-ready convenience.